So, it’s been a while since I fell this hard for a book. I Was Born for This is my first foray into the work of Alice Oseman, but I feel sure she will feature among my favourite authors for some time to come. Incredible, then, that I almost dismissed it as a novel I wouldn’t enjoy. If not for the fact that it was nominated for a 2018 Goodreads Choice Award in the Best Young Adult Fiction category, thus peaking my curiosity, I might never have picked it up at all. To begin with, I owe Alice Oseman a massive apology for my preconceptions going into this book. From the blurb, I was fully expecting a predictable modern fairy tale where a fangirl meets the pop idol she has fantasized about for years, at which point they fall madly in love and he spirits her away from her drab existence. Needless to say, I couldn’t have been more wrong. What I found myself reading was something fresh and original, painfully authentic, and a surprise in the best possible way. I Was Born for This stars some truly memorable characters, as unique and multi-layered as anyone you might bump into on the street. Angel Rahimi, the Muslim girl with the runaway tongue and passion for pop-rock band, The Ark; tender-hearted Jimmy Kaga-Ricci, The Ark’s transgender frontman who suffers from severe anxiety; Jimmy’s bandmates, utterly different from one another, and yet closer than brothers. I connected with every one of them, so that by the end of the novel, I felt I knew them inside out. I also adored Angel’s parents. So many fictional portrayals of Islamic culture focus on the store they set by arranged marriages and their mistrust of western values. I know, of course, that there are Muslims who adhere rigidly to tradition, but there are also those who take a more liberal view, and it was wonderful to see this depicted here. In the case of the Rahimis, all they want is for their daughter to be happy and learn to appreciate her own worth, and this warmed my heart right through. What I loved most about this novel, however, was how it encompasses so much diversity, reflecting the world we live in. There are characters from different races and religions, class and background, as well as those who fall at various points along the LGBT+ spectrum. Yet, this is handled with a subtlety that’s truly refreshing. A character might be black or mixed race, gay or bisexual, Christian or Muslim, but, just as in life, it doesn’t define them. These traits simply form one part of who they are. 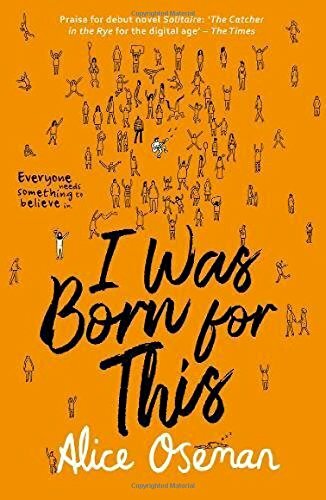 For writing that is fresh and real, some unforgettable characters, and a story so many readers will be able to relate to, I Was Born for This by Alice Oseman gets 10/10 rainbows.